Blogs DNA has some great suggestions for tweaking the Firefox 3 about:config file. Customize Firefox 3 to your particular preferences with hacks to reduce the number of auto-complete list in your URL bar, extend spell check to forms, and disable blinking text. All it takes is a few simple modifications to the about:config file. By editing the about:config file, you can have a Firefox 3 that is faster, less bloated, and more tailored to your browsing habits. 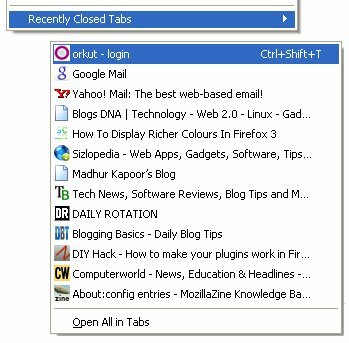 Do you have any suggestions for tweaks to Firefox 3? Plenty of USB storage keys are on the market, but Ironkey is the first to use military level encryption. Sold in 1GB, 2GB, and 4GB sizes, the key features a processor called the Cryptochip, which uses Public Key Cryptography ciphers linked to an online account to create encryption keys on the hardware. A Federal Information Processing standard 140-2 compliant true random number generator on the Cryptochip ensure that encryption keys are extremely secure and totally random. Ironkeys come in different sizes, but there are also three different versions, each with unique features. The basic version has a very James Bond-esque feature to destroy the data on it in case of an emergency. The personal version is loaded with Firefox 3 with various addons that make browsing encrypted and anonymous. The enterprise version is made to order with no specific price on the IronKey site, just a form to order one built to your specifications. All of them support Windows, OS X, and a large amount of Linux distros, and they all come in tamper proof and water resistant cases with a brushed metal finish. We tend to think this level of security is overkill for the average person, but people can’t seem to get with our freewheeling approach to security; remember, we leave our WLAN open. TippingPoint’s Zero Day Initiative reported a critical vulnerability affecting Firefox 3.0 yesterday. It includes the 2.0 versions as well. It’s unreleased and Mozilla is working on a fix already. Whatever the exploit is, it does require the user to visit a malicious site or click a link to executed. It came in 5 hours after the FF3 release, but since it affects previous versions, we wonder if the researcher was just sitting on it to be first. The Zero Day Initiative pays researchers for the exploits they submit.